sunyfeel Newest Fitbit Ace/Alta HR Band Replacement, 12 colors Fashion Sports Silicone Personalized Replacement Bracelet with Metal Clasp for Fitbit Alta HR/Alta by sunyfeel at Kode Fu Guru. MPN: 43235-32747. Hurry! Limited time offer. Offer valid only while supplies last. Compatible Devices: Fitbit Ace/Alta/ Alta HR. Specification The wristband is made of silicone, it's harmless to human body, no allergic reaction. Compatible Devices: Fitbit Ace/Alta/ Alta HR. Fitbit Alta HR and Alta band only,tracker or other parts are not included. 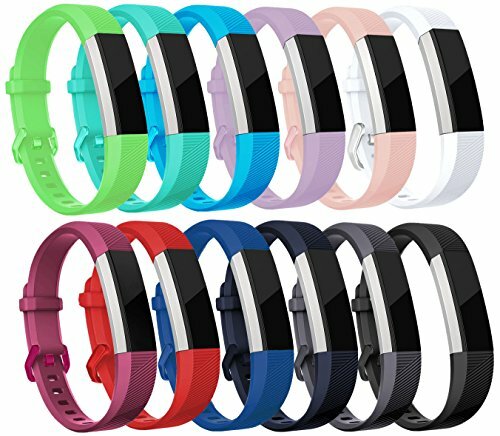 Silicone material is well made, durable, soft and comfortable, suitable for Fitbit Ace/Alta HR and Alta ,with highly tear resistant, ultra-strong tension. Durable TPU material to bring a comfortable experience, Watch buckle / Clasp will will ensure that your Ace/Alta HR watch is safe to keep your Alta HR watch alive,dancing,exercising sweat, sleeping or traveling safely while saving you device of. ACE/Alta hr band feels very comfortable . Eco-friendly, low-ke，available for both men and women when sport, dating, meeting . elegant and practical. Best gift for yourself , your family and friends! Fitbit Ace/Alta HR tracker or other parts are not included in the product. If you have any questions about this product by sunyfeel, contact us by completing and submitting the form below. If you are looking for a specif part number, please include it with your message.